Find the perfect writer with AI. 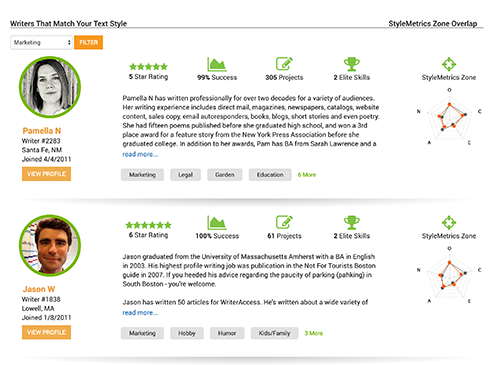 StyleMetrics Matcher uses Artificial Intelligence to match you up with writers that have a similar tone, style and expertise. The algorithm uses text analysis to create a projected profile of the author that’s matched with our writers profiles and samples. Shazam! We'll match you up! Get your private page link. Simply drop in your text. And we’ll instantly create a profile of the author projecting the big five personality characteristics. This information is used to match you up with WriterAccess writers that have similar profile based on analysis of their work. Instantly, we analyze the text. Our patent pending algorithm developed in tandem with Cambridge University and IBM Watson creates a projected profile of the author that helps us poinpoint the writng tone and stye that we can magically match up with writers. You’ll get your own landing page packed with writers that match the tone, style and psychometrics profile of the author we recommend you explore. Sort by industry to find the winners, review their experience and samples, and pick the winner to try with a project. You’ll need to become a member of WriterAccess to test drive our services. But you only pay for content you approve, and you can cancel your membership anytime. Setup a Demo if you want to learn more. Or give us a whirl! GET STARTED NOW-- RISK FREE! Sure. Our members have cool resources to find writers like casting calls and writing style contests for projects. But sifting through hundreds of qualified applicants to pick the winner is a challenge, with so many choices. Text analysis seemed like the right place to start the research process. We discovered two solutions with the integration solution we required: IBM Watson and Cambridge University in England both offering text analysis solutions. 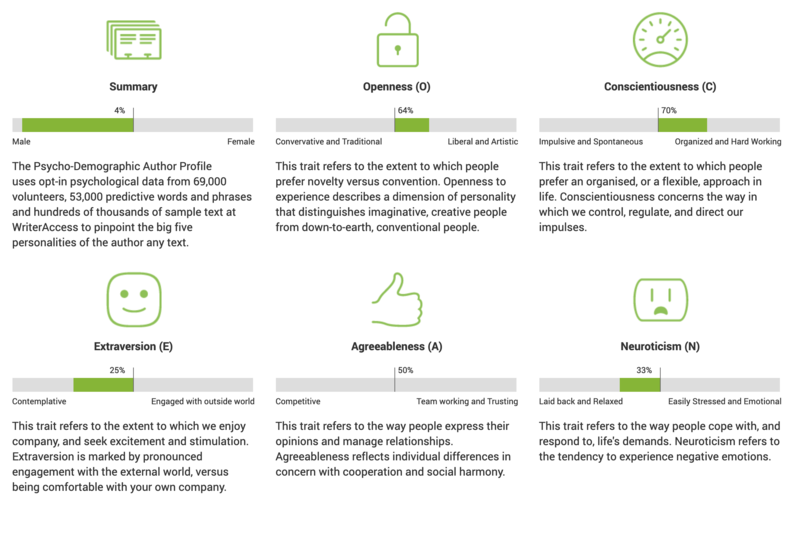 The CU and IBM tools analyize text in a cool way, creating a profile of the author projecting their big five personality characteristics. CU's algorithm was developed comparing 300,000 personality test with their text samples to create the model. IBM's sample size is much less, pulling from 25,000 volunteer writers. We proposed the impossible to Cambridge University: Scan 1 million samples of projects completed by our Writers, and develop projected profiles of each writer we could then “match” on-the-fly with customers. You’re kidding, right? The next generation is born. CU agreed to the modeling, and developed a pilot program for the new match-making services we blind tested with thousands of customers. Take a look at the results announced by the CU Director of Psychometrics at our annual Content Marketing Conference. 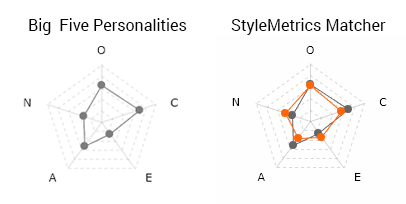 Anyone can give the StyleMetrics matcher a test drive by using the service above. We’ll send you your own PURL(Personal URL) that shows the projected profile of any text you submit and recommended writers that match the text tone, style and expertise. Clients rave about Marjorie's work. She has a clear, clean writing style and research skills honed as a law journal editor. She has written articles online for more than 15 years and has also written humor for American Greetings and crossword puzzles for the New York Times. She wrote an entertainment blog that was consistently in the top 5 in the Google search results, and at its peak was #1 out of a total of 66,499,997 results. She has a B.A. in Psychology from UC Berkeley, an M.A. in Creative Writing/English from SF State, and a J.D. from UC Hastings College of the Law. "This may well be one of the best pieces of work that I have ever read. Thanks Marjorie." "Thank you I love your writing! Probably because it sounds so much like me! ha"
"Great article! Thanks for the fantastic content for our clients." "Fabulous! We've been looking for a decent writer to assist us with our blogging and after several bad experiences, I think we've found you!" "This is awesome! Looking forward to working with you again." "The article is well written, draws the reader in, and is pragmatic and to the point." "Great job! This is exactly what we are looking for. Thanks!" "This is fantastic. Thank you, Marjorie, for writing this blog for us!" "Thank you for this article! We are very happy with this, and will be sending over more work your way!" "We are VERY pleased with this work." "I am so very happy with this piece!" "Great Work! Thank you. I will send more." "You are awesome! I appreciate you and your craft!" "We enjoyed what you did." "Fantastic work, Marjorie! This is just what we're looking for." "You're doing a great job on these!" "Fantastic article Marjorie, thank you!" Marjorie is amazing! She works quickly, communicates clearly, and brings a sharp, insightful intelligence to every project. I loved working with her. Excellent writing. We'll definitely hire again. Marjorie R performs exceptional work. I intend on working with her for a long time. Marjorie R is a classic case of “do great work, and the recognition will follow.” The client she did this brilliant work for was a legal client with very—and we do mean very—high expectations on the content they ordered. Marjorie went into the project knowing full well revisions were going to be part of the job. However, that didn’t stop her from putting forth her A-game. The client’s reaction? Utter delight. Marjorie knocked this client’s socks off. No revisions necessary, she nailed it on her first attempt. Well done, Marjorie! We tip our hats to you. Marjorie knows that content must be compelling to cut through the clutter. Your potential customers have a million other things they could be doing besides reading the content on your site. Marjorie's content will capture and hold your audience's attention. She writes clear, persuasive, fluff-free text that informs and/or entertains while getting your message where it needs to go.